I used to think the key to a good apple pie was a butter- or shortening-laden flaky crust and lots of sugar to balance out the tartness of the apples. That was until I tried our Test Kitchen manager Stacy’s version of deep-dish apple pie. Find out her secrets and get the recipe here. 1. Keep the fat in the crust to a minimum. Butter isn’t totally off limits, just use less of it. She uses reduced-fat sour cream to replace some of the butter. It keeps the dough moist and tender, without adding tons of saturated fat. And she follows the basic rules of great pastry: always use chilled butter and ice-cold water, use a light hand when working with the dough, and let the dough chill before rolling it out. 2. Add some fiber by using a mixture of whole-wheat flour and all-purpose flour in the crust. There's a fine balance between making your pie crust healthy and making your pie crust taste like cardboard. The results can be less than appetizing if you use all whole-wheat flour, but Stacy uses a mix of traditional all-purpose and whole-wheat pastry flour. The pastry flour adds fiber, but keeps the texture tender, and by blending it with all-purpose you get a less wheaty taste. 3. Choose apples for flavor and texture. And use plenty of them! 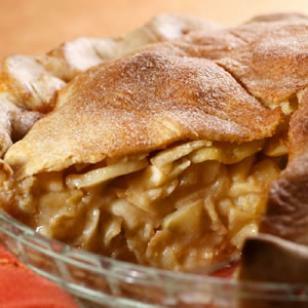 Apple pie should taste good, but not feel like mush in your mouth. Stacy uses a mix of McIntosh and Granny Smith in her pie. The McIntosh add a nice tangy flavor while the Granny Smith also taste good, but break down less when they cook, giving the filling a more toothsome texture. And since this is apple pie, use plenty of fruit. Stacy made her version deep-dish so there’s extra room for the filling (and more apples means an added bump of soluble fiber). 4. Keep your sugar in check. Apple pie is about apples. Why drown them in sugar? Clever Stacy cooks down a portion of the apples for the filling before she adds them to the crust. Why? Well, so the crust doesn’t collapse and crack as much while it’s baking (the filling won’t shrink as much if some of it is already precooked) and it concentrates the natural flavors and sugar of the apples, so you don’t have to add as much sugar to your filling.